Kaziranga National Park is the world's primary protection area of the Indian rhino. The park is located in Assam, Northeast India. The natural surroundings consist of tall elephant grass, marshland, and dense tropical moist broadleaf forests, crisscrossed by four major rivers, including the Brahmaputra, and the park includes numerous small bodies of water. Two-thirds of the world's Great One-horned Rhinoceroses live in the park, and Kaziranga has the highest density of tigers among protected areas in the world. The park also has large breeding populations of elephants, water buffalo and swamp deer. Located on the edge of the Eastern Himalaya biodiversity hotspot, the park combines high-species diversity and visibility. This huge 430km2 National Park in the northeastern State of Assam has as its great attraction its daily elephant rides at dawn.Visitors mainly flock here to view the park's wildlife, mostly the Indian unicorn rhinos numbering now almost 3000 pieces.Their horns are so precious that just in 2013, 37 rhinos have been killed by poachers.The powder of the horns is then sold to China and Vietnam for medical purposes.Its worth more than gold.better to arrange a safari with the second slot around 7am.Not only because of the morning fog and higher temperature, especially in winter, but also the spots where the rather shy rhinos are hiding in thick grass, has already been discovered by the earlier groups.Other animals are the Wild Buffalos, the King Cobra and Pyton snakes, the Swamp and Hog deers, Bengal tigers and migratory birds from Siberia, all very much appreciating the waterways of the wide Brahmaputra river.In fact the grassy lowlands are mostly flooded during the rainy season in summer.Best time to visit is from december to april when temperatures are low. Whilst it was perhaps unsurprising that Manas had not previously received a review on this Web site I am amazed that, to date, neither has Kaziranga! It can surely only be that relatively few “WHS enthusiasts” make it up to NE India - a shame as it provided us with some truly world class wildlife viewing experiences. Kaziranga is far more developed for tourism than Manas (which is around 7 hours west by road). Indeed at Kohora a significant “tourist village” has grown up with a wide range of hotels. The “Central” park entrance is situated there but the Western and Eastern entrances are also worth considering c 15 and 25 kms away respectively so a Gypsy hire costs more) We gave the park 2 full days and had morning and afternoon game runs by Gypsy (jeep) on both and an elephant ride on one morning (bookings required!!). Unlike at Manas, the Jeep rides are limited in time to around 2.5 hours with the morning one starting at around 7.30 after the 2 morning elephant rides are complete (they start at c 5.30 and 6.30 am and last up to an hour – but usually less!!). If you are not mobile you can go to the Central HQ, pay your fees (including 500 IR for a camera if you are a non-Indian) and rent/share a Gypsy there – you would also need a short Gypsy hire to get to an elephant booking as this starts some way from the HQ. We spread our time across the park with a morning drive in from the Western entrance, an afternoon from the Eastern and morning and afternoon drives from the Central. Foreigners are only allowed to do elephant rides from the Central entrance. We were told this was because the elephants there are under park control and “safer” but I suspect it had more to do with ensuring that the high “foreigners fees” went to the Park!! We particularly enjoyed the Western trip where we were blessed with superb close ups of elephant and rhino but the other areas were also excellent. I would definitely recommend the elephant ride and wish we had taken an extra one – the elephants go right in among (at (15/20 metres) the Rhino and Buffalo in the tall wild grass and the result is an amazing experience which I place among my “world best” wild life viewing list – even if it is far too short in time!! I would try to get a howdah with side seating as this is more comfortable and easier, I feel, for photography. During our Eastern visit we passed a truck carrying body bags containing 2 poachers who had been killed in a shoot out that early morning in a northern part of the park (in the closed area for visitors) – behind it was the blood stained trolley on which the bodies had been carried out from the forest to the nearest road. We were also shown the hand made gun they had carried – this brought home the reality and seriousness of the poaching and the need for the armed patrols we had seen setting out in Manas. Apparently 9 rhino had been killed in Kaziranga during the first 2 months of the 2012/3 (Nov/Dec) season already (plus 1 in Manas). In fact, Kaziranga is currently very well stocked with rhino (not of course a reason for accepting their being poached!) – hence the transfers to Manas. They can even be seen alongside the road to Kaziranga from the West where the road is the park boundary and, inside the park, we must have seen over 100. But the difficulties which arise when rhinos and people live close together were demonstrated as we drove back from our first morning game drive. There the southern border of the park is set back a few kms from the main road but no one has told the rhino and we watched as one male with a magnificent horn marauded among the houses and paddy fields, totally confused as he was chased by a horde of small boys who scampered up electricity pylons as he turned to confront them! On our second morning we had been lucky enough to get a quick glimpse of a tiger from a viewing platform and decided to invest our final hour in the park that afternoon by returning to the tower to see if we could get better views. And luckily we did. 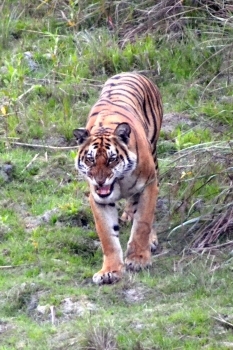 I would not recommend anyone to go to Kaziranga with the objective of seeing tiger. Rather, hope to be satisfied with the guaranteed best viewing of rhino in Asia – but tiger are there and we had a glorious few minutes up our tower looking down on a male tiger prowling unconcerned through the grasses. But then the bane of watching Indian wild life – people!! Guides depend on tips and tigers mean tips so there is a code to tell all their colleagues when a tiger is seen. Soon, text messages were winging their way to every Gypsy within reach and jeeps were screeching in from all directions. Now, Indians can be lovely people but they are used to a noisy family/social environment. Faced with a wall of chatter our magnificent tiger looked up, scowled, growled and loped surprisingly quickly across the open ground in front of the tower and into the forest. A fine end to a fine visit to a fine park and a fine WHS!! Holocene: What Kaziranga is today was perhaps once the main channel of the red river which habitually changed its course over the century due to earthquakes at various points of time....This volatile movement of the river is surely responsible for the heavy deposition of silt and the simultaneous formation of beels of various lengths and depths in this area. The landmasses formed by the heavy deposition of silt in this riverine area thus gradually stabilised with the natural growth of saccharum and other grass species. The swift and unpredictable river still erodes a large portion of the land mass, particularly in those areas where bigger trees have not yet sprung up...this on-going process of erosion and deposition of silt on the northern boundary of the park, which is the Brahmaputra river itself. Seasonal WHS: The Park is closed from Mid April to Mid October due to monsoon rains during which the Brahmaputra breaks its banks.